We thought Cookie would enjoy this dog race since she always like to run madly unleashed in the park or dog run. "3, 2, 1, go!" And where did Cookie go? The other owners were shouting so loud for their dogs that Cookie couldn't hear me. She was distracted. She didn't know she was supposed to run towards me at the opposite end. She was on the same spot looking left, right and at Vincent, until all the dogs have reached the finishing line. She then realized that she was off leash and ran outside of the race area to find me on the other side! Undeterred by the first failed attempt, we went back to the dog race again to give Cookie a chance to run like mad. This time, I swapped place with Vincent since his voice is louder and there's a better chance for Cookie to hear him across the field. 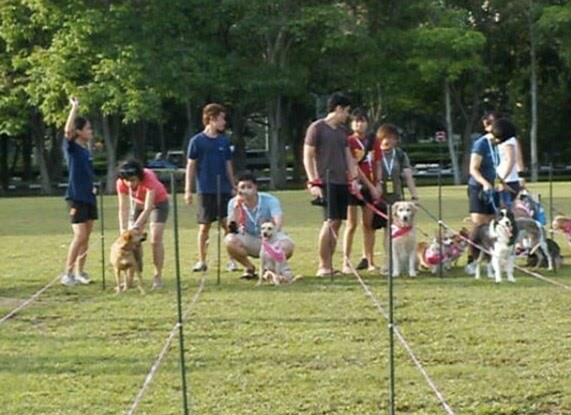 At the final, Cookie stood side by side with other pedigree dogs such as Golden Retriever and Grey Hound. There were numerous false starts with Cookie being one of the offenders. She was so excited to run towards Vincent, haha! In the end, Cookie didn't outrun the Grey Hound and came in second, but hurray for the Singapore mutt! After the race, Cookie seemed tired. 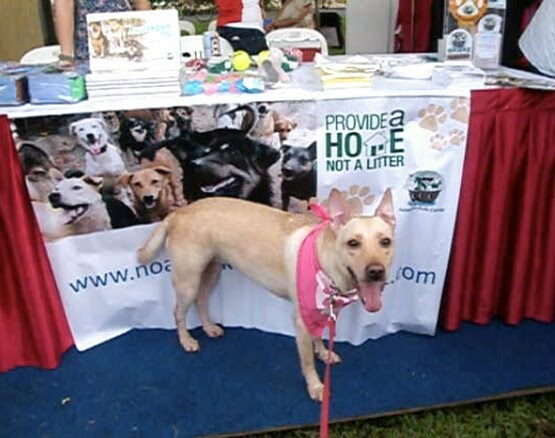 While we were catching up with the volunteers at Noah's Ark CARES, Cookie stood in front of their banner and didn't move for a while. She was trying to cool down. She kinda blend into the background. Next, Cookie made her maiden attempt at Doga...in the next post.